The following profile is a representation of the Kentucky public education state longitudinal data system (SLDS) as presented through publicly available resources of public primary, secondary and higher education, information made available to the public through the National Center for Education Statistics (NCES), the Data Quality Campaign, published research articles, other third party internet resources (as noted), and direct contact with state and federal public education officials. It is not a formal program evaluation. The Kentucky Longitudinal Data System (KLDS) is Kentucky’s state longitudinal data system (SLDS) managed by the Kentucky Center for Education and Workforce Statistics (KCEWS), an office of the Kentucky Education and Workforce Development Cabinet (EWDC). The KLDS, created for the purpose of collecting and analyzing Kentucky public education data at the individual, course, institution, and system levels, aggregates data records from the breadth of the Kentucky public education collection systems and workforce databases. The combined data collection systems are part of a nation-wide effort to record granular public education detail over time in order to document the entirety of students’ education experience. This information is intended to be available for analysis and public policy consideration for the purpose of producing improvement in student learning at elementary, secondary, post-secondary, and higher education levels, and to optimize labor market outcomes, individually and generally. Kentucky is one of the 47 states having received public funding to create a state longitudinal data system (SLDS). Despite state-to-state differences, each SLDS shares a common purpose of supporting research and analysis with the intent of informing individual, household, and public policy decisions based on standardized criteria. This review assesses the overall quality of the KLDS as an SLDS by considering the nature of the organization maintaining the data system, those agencies and institutions providing inputs to the data system, and to which agencies and institutions the data systems’ outputs are available. The assessment also considers the data system’s funding mechanisms, internal and external researcher data accessibility, the quality of the data system’s public user interface (dynamic reporting tool), and the data system’s current Data Quality Campaign (DQC) ranking. This report considers each of these criteria pertaining to the KLDS and provides contact information to the departments and individuals who maintain and manage the KLDS. The KLDS is actively managed and maintained by KCEWS, a state government agency housed within the EWDC. KCEWS was ratified into law in the 2013 legislative session to expand on the work of the Kentucky P-20 Data Collaborative, a joint effort from the Kentucky Department of Education (KDE), the Kentucky Council on Postsecondary Education (CPE) and the Kentucky Education Professional Standards Board (EPSB). The Kentucky P-20 Data Collaborative successfully developed and created the KLDS but was funded solely through federal grant awards. KCEWS, a 20% state-funded office, was created to expand upon the preliminary work of the Kentucky P-20 Data Collaborative and ensure that the state would have a sustainable tool to examine students’ education and workforce outcomes. KCEWS is legislatively authorized to collect and link data from the various Kentucky education and workforce data systems that provide data records to the KLDS. KCEWS stores these data records in the KLDS data warehouse and uses a de-identified reporting system to remove identifying variables from the data, such as names, social security numbers, addresses, etc. KCEWS is responsible for using the data records located within the KLDS data warehouse to develop reports and statistical data about education and workforce. (Several annual reports available on http://kcews.ky.gov) These reports and statistical data are provided to state policy makers, agencies, practitioners, administrators and the general public to allow them to evaluate education and workforce efforts in the state of Kentucky. Direct access to data in the Kentucky Longitudinal Data System shall be restricted to authorized staff of the office. Provide general oversight of the office. KCEWS receives data from over 15 sources which include early childhood learning, K-12 schools, higher education, and employment and wage records. 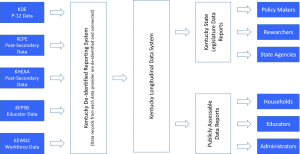 KDE provides data records to the KLDS through its K-12 longitudinal data system that collects individual student level data pertaining to students in the state of Kentucky. CPE provides data records to the KLDS through its postsecondary reporting data system, a longitudinal data system that collects data records from public and private higher education institutions in the state of Kentucky. KHEAA provides financial aid data pertaining to postsecondary education through its postsecondary reporting data system. EPSB provides teacher certification and licensure data records through its EPSB data portal, a data repository that collect data records pertaining to Kentucky educators from the Educator Preparation Institution’s Admission and Exit Reports and the Teacher Certification Database. The EWDC provides workforce data records through the various data systems of the state agencies that comprise the cabinet. According to KCEWS, the data records provided by each of these state agencies and institutions are linked through the De-Identified Reporting System (DRS). Once these data records are linked, the DRS assigns a unique identifier variable to each set of linked data records and removes any other identifiable data variables. This process validates data interoperability between the state agencies and institutions’ data systems, a necessary requirement for a functional longitudinal data system. The KLDS’s public user portal is operated by KCEWS for the purpose of providing useful aggregate level data about various education issues to interested parties within the state of Kentucky. These parties include administrators, educators, policy makers, parents, students and other parties’ interest in education outcomes within the state of Kentucky. The quality of the KLDS public user portal will be evaluated using several different criteria which include: the user-friendliness of the portal, the extent of data offered by the portal, whether the portal is self-sufficient or relies upon other webpages to provide information, and the extent of customizable reports that can be created using the portal. The KLDS portal is located within the Data and Reports tab of the KCEWS home page, the home page clearly explains the purpose of the KLDS and the public portal clearly and effectively. The portal explains what data each section of the KLDS contains and what reports can be generated using this data. The portal also provides instructional information on how to generate these reports. The portal also has a Contact Us tab listed on the KCEWS home page which allows users to easily reach out to KCEWS staff members. The KLDS portal offers information pertaining to several different education categories, including: high school feedback reports, postsecondary feedback reports, early childhood profile reports, county profile reports, teacher preparation feedback reports, and Kentucky adult education feedback reports. The KLDS portal also offers several white paper reports which combine various data records from the above mentioned education categories to produce comprehensive analyses of Kentucky’s education and workforce outcomes. The portal also provides access to aggregate data records of the above mentioned education categories. The KLDS portal provides direct access to each of the education categories and reports listed within the portal. In addition of this information, the portal lists quick links to each of the agencies and institutions that provide data records to the KLDS. The KLDS portal allows interested parties to create customizable reports about the education categories listed within the portal. These reports allow the user to change several input variables to specify the type of information they would like to access. The user can specify the cohort year and type of report they would like to receive pertaining to that cohort. The user can also specify the particular institution or group of institutions that will be analyzed in the report. The Kentucky Legislature addresses the specific function of the KLDS and its overseer in Chapter 151 of the Kentucky Revised Statutes. Statute 151B.132 officially establishes the KCEWS as an entity attached to EWDC and defines its intended purpose. This statute also designates which state agencies must provide data records to the KLDS and the mechanisms through which KCEWS may receive funding. Statute 151B.133 defines the specific duties of KCEWS and establishes the state and federal laws the department must comply to. Statute 151B.134 establishes the Board of Kentucky Center for Education and Workforce Statistics, the state agency members that must serve on the board, and the duties and functions of the board. This schematic is offered to provide a simplified, visual presentation of the KLDS and the channels through which data flows into and out of the SLDS. The entities on the far left side of the schematic represent the data record providers to the KLDS. The entities in the middle of the schematic represent the KLDS data system and public user portal. The entities on the far right side of the schematic represent the parties intended to receive benefits from the outputs generated by the KLDS.